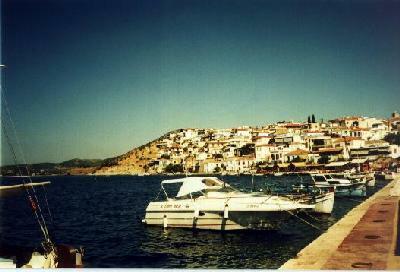 Ermioni is a small town in the Peloponnese (of Greece). 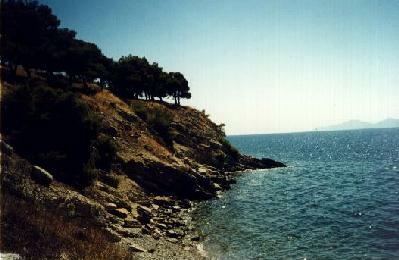 It is on a very small out-cropping of the land from the peloponnese facing the island of Hydra. In fact I got to watch a very beautiful moon rise of the moon over Hydra when I was there. The town has existed in the site for over 2000 years (it use to be called Hermioni) and there are ruins of old buildings popping out all over the place. It is said that Hermioni was one of the gateways to Hades. There are not ruins that support this that I do know of. There are the foundations of two Doric temple on the Beasty. One person told me that one was a temple of Apollo. That also happened to be his son's name. I would venture a guess that at least one was a temple to Posiden, the God of the Sea. Ermioni is a quaint little Greek village. Being on a little bit of land jutting into the sea it is only 4 blocks wide at the largest part and about a mile to a mile and a half long. The lack of any thing resembling a sandy beach has saved it from the mass impact of tourism but that doesn't mean there is not great swimming there, or tourists. The swimming is great and there is a night life in this little town. Fishing is the primary industry, however there is a good tourist trade in the summer. Partly because the Flying Dolphins (High speed boats) stop here on their way to and from some of the islands. 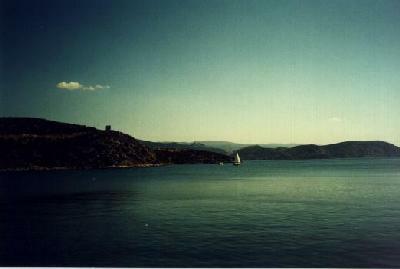 I had the good fortune of staying here during both of my trips to Greece and found it to be paradise. Most of my photos are from the very end of town where there aren't any houses. There are trees around some "ruins" on the very end of the land where the town abruptly droops into the sea. The locals call it the "Beasty" because of the trees. The point is called Myli which also happens to be the name of one of my cousin's cat's. Along the south part of the beasty is where the best swimming is, however it is also very scenic. There are also a fair amount of pictures from around town, but since the town has water on all sides, most of the shots have water in them. I hope you enjoy them. Any comments, please E-mail me, . 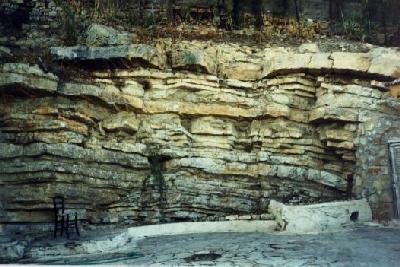 This is the "second" swimming hole on the beasty, the one I spent a lot of time at. This picture is looking out towards the end of the Beasty. You can see the island of Hydra in the far right corner. 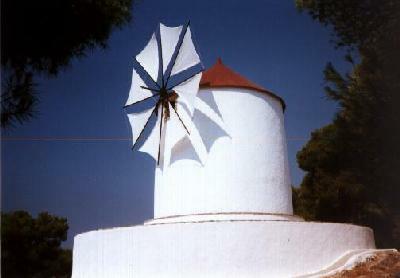 Mikinos is known as the Greek island with all of the windmills. However other towns, including Ermioni, seem to be building them. This one was just finished when I left. Unfortunately, on my last trip, the windmill was broken. This is the south side of town looking out over the sea. This picture is also of the southern side of town looking the other way. As you can see the traditional white washed houses are ever present. However, see if you can find the bright yellow house hidden admits them. This house apparently started a trend and there are now at least 4 houses that are painted bright yellow. Thank you for viewing part I.